We realize podcasts aren’t necessarily supposed to have seasons. But hey, Congress isn’t supposed to ask stupid questions of powerful tech CEOs, either. For the last time in 2018, bamboozling tangents that involve San Diegans throwing scooters in lakes, important ethical questions about Google’s societal responsibilities and a healthy dose of luddite shaming await you. 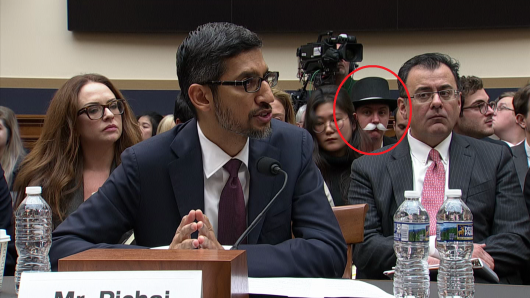 A lot of ignorance sloshed around the hearing room when Congress attempted to grill Google CEO Sundar Pichai – and Jeff and Francis were quick to call it out. But the biggest farce is what wasn’t discussed at the hearing. Such as the fact that Google’s algorithms are in a black box. Nobody fully understands them, or for that matter, the full extent to which Google uses data. And what about the moral integrity of its algorithms? How do you encode ethics into a massive database that determines so much about what content the world sees? Do you even try, or do you let the results truly mirror some societal consensus, as Google claims it’s doing? Congress had a huge opportunity here to probe Google’s more cloak-and-dagger qualities, and they squandered it by focusing on things like why “idiot” is equated to Donald Trump in search results. If Google could determine certain search phrases correlate to a homicide, should it be their obligation to do so? Jeff thinks luddites should not be allowed to represent the people (Francis disagrees). Jeff spoils a plot element of the new “Mission Impossible” at 9:23. Not cool, man. Everyone wants to take a stab at what’s going to happen in the year ahead, and Francis is annoyed by that. At least he was, until he went on yet another tear about TikTok as the next big thing (which is admittedly a fascinating app and may have some future in content marketing). I’m not sure where the conversation converged on Red Dead Redemption 2 cinematic mode (again), Jeff’s Golden Eye acumen (psh, ok) and whether product placement should exist in video games (hard “no,” says Francis). But at the very least, I’d like to tie up Francis’s point about prognostications with some content marketing advice: If you do it, put some heart into it. What Francis may have been getting at before he went off the rails is that you should scrap the obligatory “trends of 2019” post if you don’t actually have anything interesting or new to say. If you’re going to prognosticate, find your “TikTok” and give us a compelling reason to care about it in the year ahead. Remember that time Francis imagined Jeff losing his job to robots? How about that other time when the duo lost an entire recording of “Above the Fold,” an oversight that became a defining moment in the podcast’s evolution? In true “Above the Fold” fashion, the retrospective was cut short by a story about Jeff’s tumultuous time riding scooters in San Diego. Between bad braking, sticking accelerator pedals and janky handlebars, the people have just had enough, and they’ve gone to Instagram to say as much. The duo closed out with a hint of what’s to come in season 2 of the podcast. For now, all we’ll say is that we have more interviews on the docket, one with Andy Crestodina of Orbit media and another with Nadya KhoJa from Venngage. Oh, and now that Jeff’s mom understands SEO, he can finally dive deeper into some of these subjects, which he and Fran fully expect to do come January.